I'm going to be honest – I just love Mitzi from Mitzi's Collectibles and I'm happy to share her butterfly decorations here today. 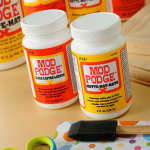 I've featured her several times, and she's one of the most talented Mod Podgers out there. She specializes in antiques, and she always thinks of something new and unique I've never seen before. 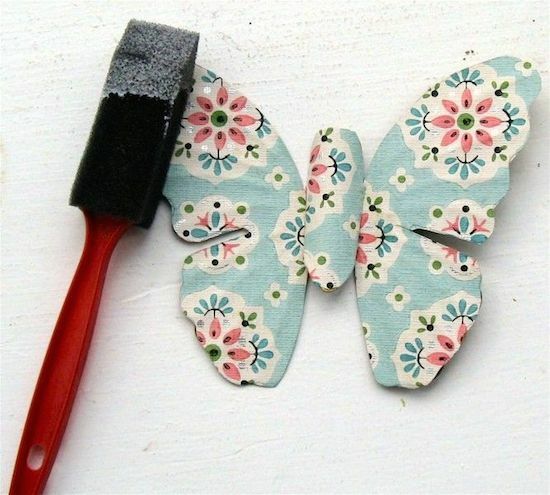 I think you'll like her upcycled butterfly magnets, decoupaged with vintage wallpaper. Here they are. 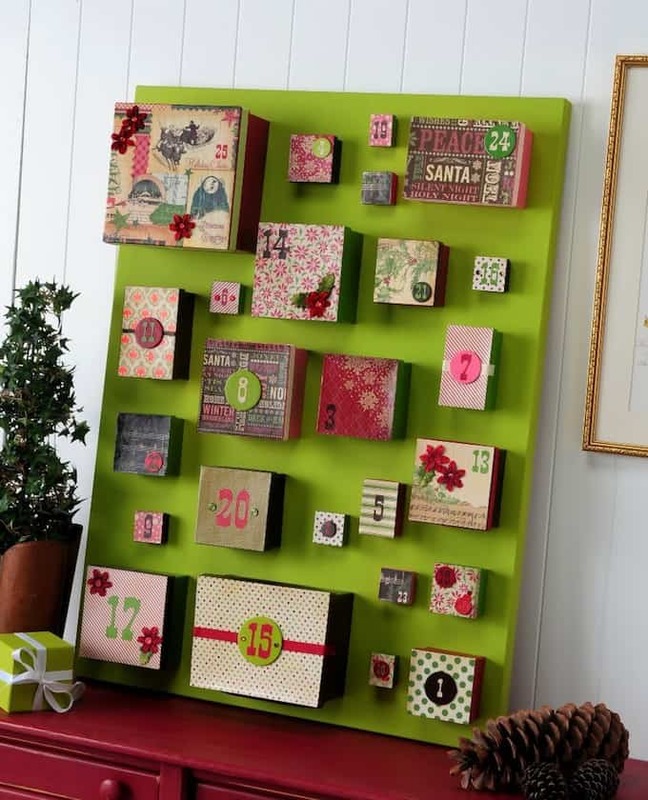 Howdy Mod Podgers, I'm Mitzi Curi from Mitzi's Collectibles and my crafting specialty is “up-cycling” vintage items so they can be used and appreciated in our modern lifestyle. 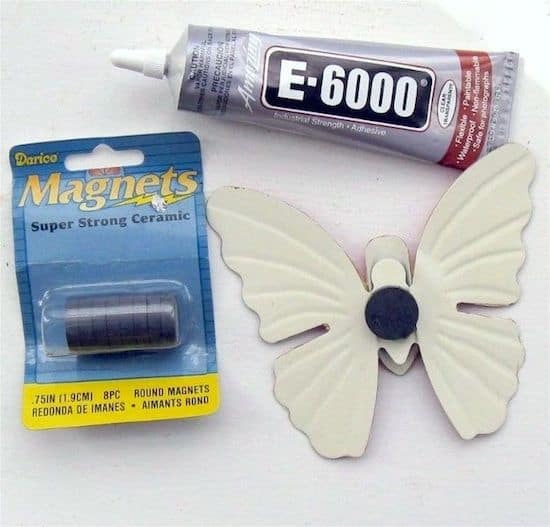 Today I'd like to show you how to make wallpaper butterfly decorations – I turned them into magnets. 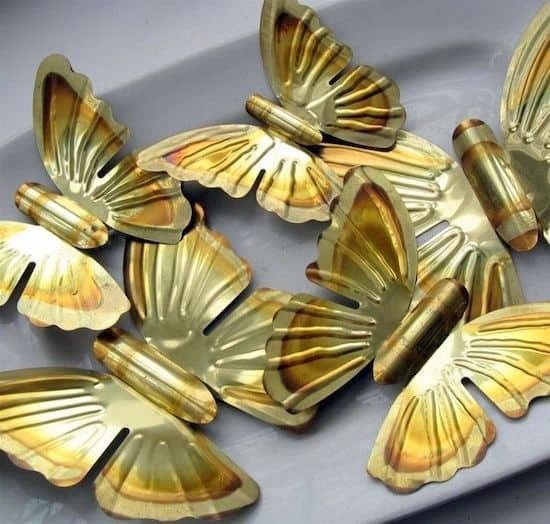 These are made from brass butterflies than many of your grandmothers or aunties have hanging on their living room walls. 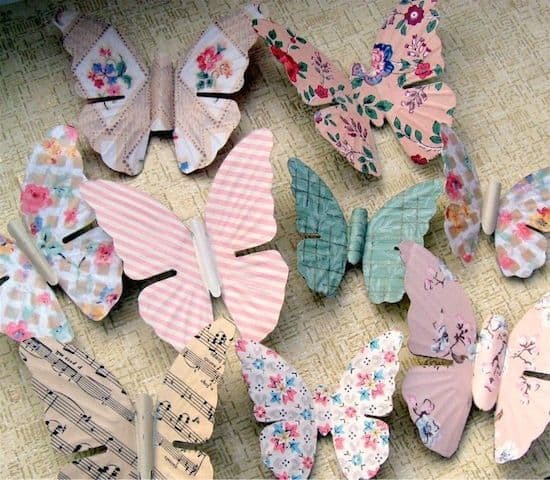 Made by Homco, they were often sold as a grouping of butterflies on a branch, or as single butterflies that could be sprinkled amidst a persons' wall decor. If Grammy won't give them up, you can look at flea markets or eBay for them. They will attach to anything metal in your home. To prepare your butterflies, take some wire cutters and snip them off the branch if they are attached to one. If your butterflies have a detachable body, like mine, gently bend the metal tabs and remove the body. I like to spray paint the undersides to give them a finished look. 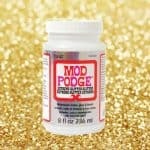 I've tried craft paint, but it requires several coats to cover the brass. 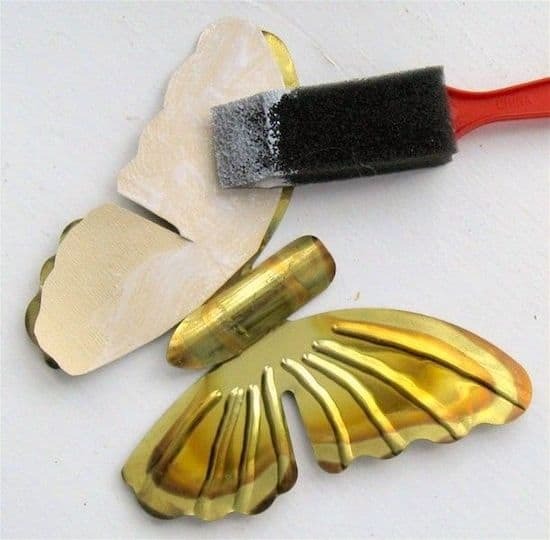 If you wish to paint your butterflies, coat the undersides and let dry. Cut out your paper. I like to end up with three separate pieces, so when cutting the paper, I cut the wings apart at the juncture where they attach to the body. There might be some guess work involved here, because you won't be able to trace completely around the wings. 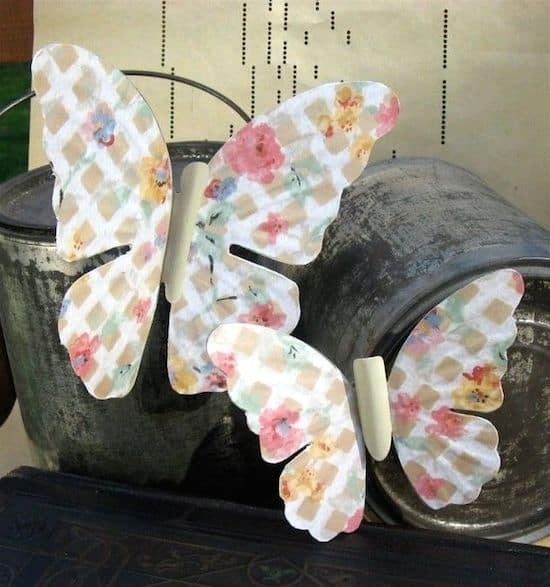 Coat the back of the paper with decoupage medium, and apply the paper to your brass butterfly decorations. I find it effective to smooth the paper with my fingers. Sometimes a brayer can be used to roll out the lumps too. Once the paper is firmly attached, topcoat with Mod Podge. Once dry, you can snip the edges with scissors if there is any paper overhang. An emery board can also be used if you want very smooth edges. Re-attach the body to the wings, then flip over and glue a magnet to the underside. A small glob of E-6000 will create a strong bond. Leave the butterflies to dry overnight. 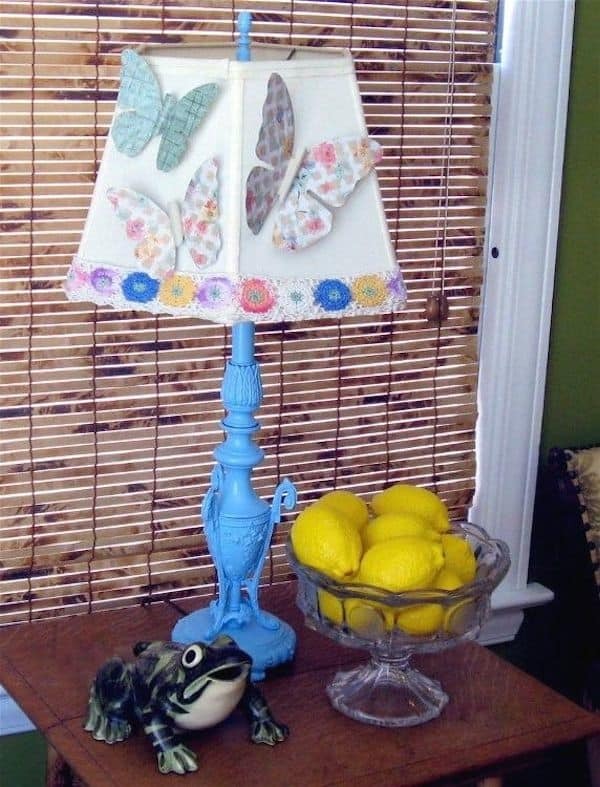 You're done with your upcycled butterfly decorations! If you wish to use for a lampshade, I have found that gluing a bit of thin fabric or paper to the magnets will insure that they won't leave any residue on the lampshade. 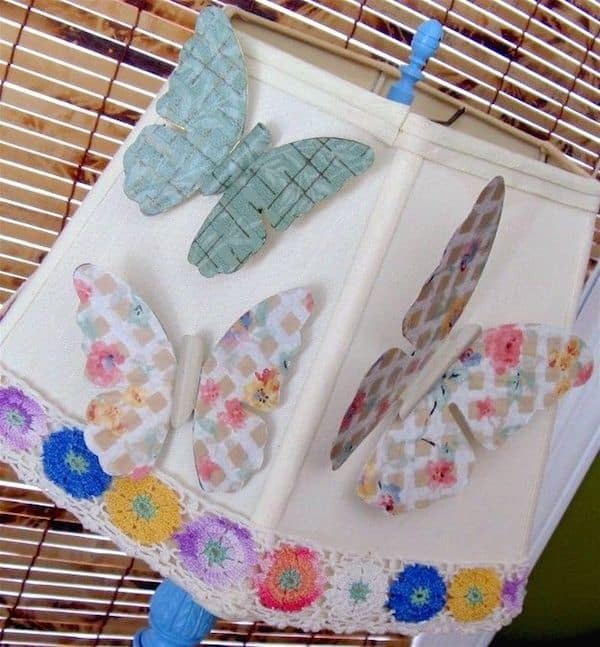 Now you need one loose magnet to put on the underside of the lampshade and you attach the butterfly to the outside. It should hold securely in place if super strong magnets are used. I then use trims I've collected to gussy up the lampshades. A butterfly or two is the finishing touch! 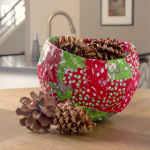 If you love vintage inspired decoupage projects, check out this other project from Mitzi – decoupaged bottles. Love the idea. I always forget to look beyond what some things once were. This will help remind me. Thanks! 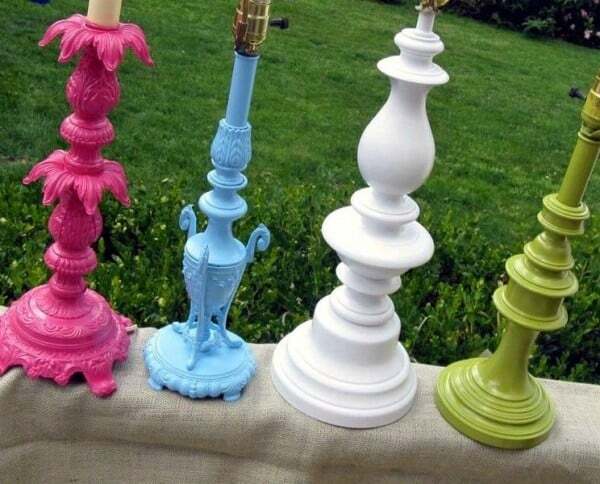 Oh my goodness those lamp bases are so great! 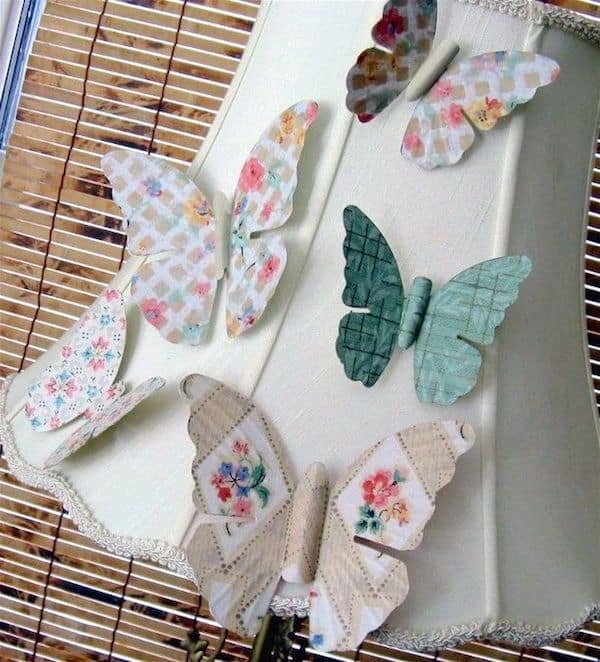 As soon as I saw those butterflies I had a vision of my grandma’s sewing room! She had like 3 or 4 on the walls. 🙂 🙂 🙂 so funny. I will have to try spray painting lamps & making these magnets! Can’t get enough of the details here. So clever. And fun to do! Mitzi! You are a genius! I must try these!!! 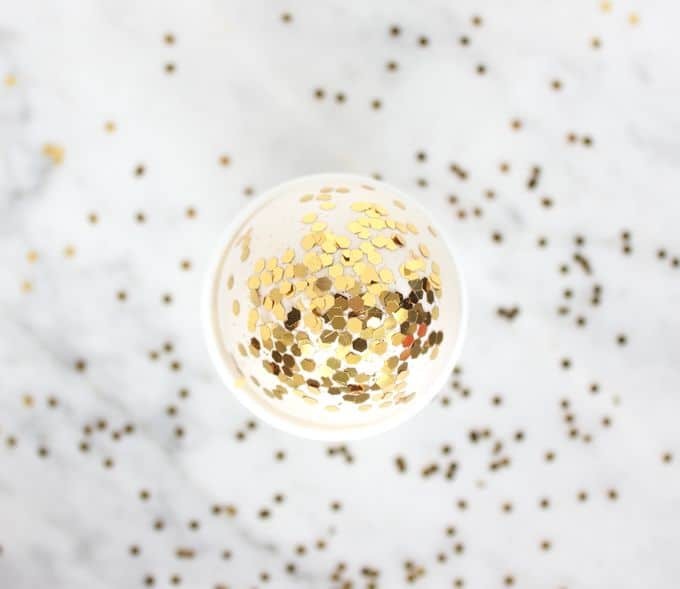 I just can’t get enough of you on your own blog and now I find you here as well! Good to “see” you!!! I sware our whole house was decorated in these Home Interior butterflies for years. I have no idea where they ran off to but this is a fabulous way to bring them into this decade quite nicely. Thanks for sharing. HAAAA!!!!!! 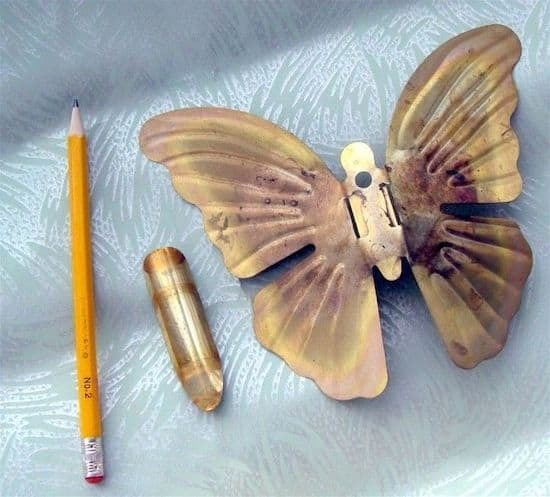 Never in my life would I have looked at those ugly brass butterflies and imagined they could ever be beautiful! (I just a personal aversion to brass LOL) Thanks so much, now I have to run back to family members that have offered these in the past!!! Your site rocks! Love!! Funny.. I had those butterflies many years back.. Sure wish I still had them now! Those look great. I found a bag of 9 at goodwill for $1 but I didn’t think about doing this. I did hang them on the trunk of a large tree in the yard and they actually look great with the different sizes. I going to have to look for more so I can have make some of these. Is this a special kind of spray paint??? Love this idea! And, the paper used is superb! Hi! I just wanted to know what kind of spray paint was used and if you used anything to prime it first? Thanks! 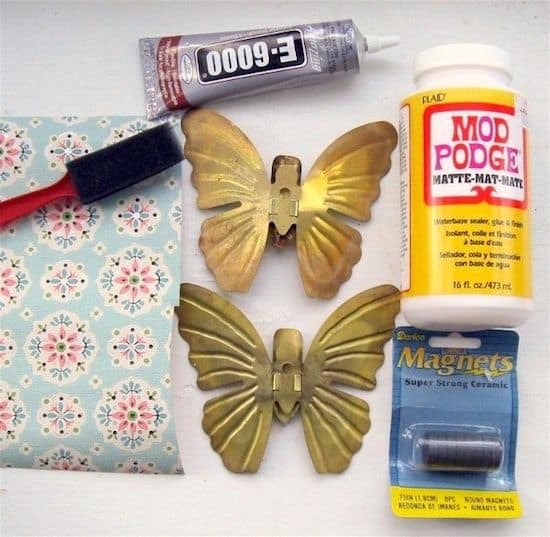 I have used more than one kind of spray paint when making these butterflies, and had no difficulty as long as I used more than one thin coat to avoid drips. Try Krylon in an antique white satin for a nice neutral color. It might be a good idea to wash the butterfly wings with soapy water to get any oils off of them from being handled and dry them thoroughly before painting, too. Love this! What a great way to make something beautiful again! Thank you for sharing. Is there any prep work to be done on the lamps before you paint them? ie. sanding or priming? Hi Dena – it depends on the condition of your lamps, but I always recommend sanding so that the paint adheres the best.